The 1970’s were a great time for RVs and motor homes. So, GMC decided to enter the recreational vehicle market with their own cutting-edge RV. They aimed to create a top-end vehicle that would blow away the competition. How did the GMC motor home fare? Let’s find out if the GMC RV stood up to the competition and if it’s still a viable motor home today. 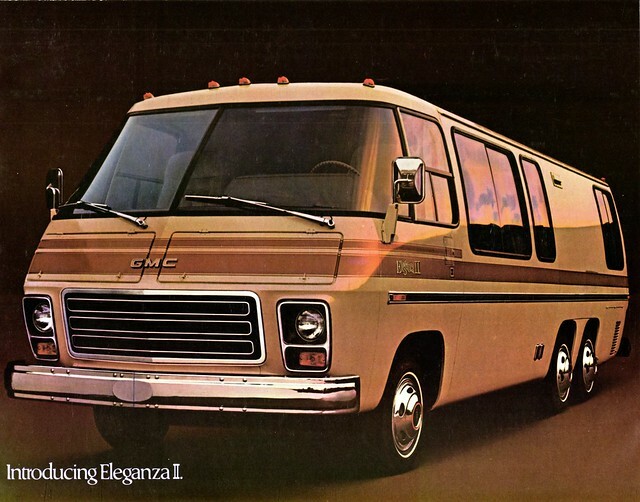 The design work for the GMC RV began in 1970 and it was planned to hit the market in 1973. The GMC motor home had front-wheel drive, rare in cars of the day, and never seen in a motor home. The drivetrain and suspension were taken from the Oldsmobile Toronado design. It had a 455 cubic inch Oldsmobile engine with 265 horsepower. The engine was attached to a Turbo-Hydramatic 425 transmission with torsion bar suspension. The rear suspension was adapted from the GM bus designs. It used dual swing arms, with one trailing and one leading. Each had a single air spring on each side. One major difference with the GMC motor home design was that it didn’t use auto body steel in its body. The body was instead made with lightweight aluminum and molded fiberglass-reinforced plastic. These were the same materials used in the Chevy Corvette. It greatly reduced the vehicle weight compared to its contemporary RVs. These design features all created a very different motor home than others on the market. No other RV at the time had independent swing arm rear suspension or front wheel drive. Also, without a drive shaft or axles underneath the coach, the floor height could be much lower, meaning a lower center of gravity. The motor home also featured a six-wheel braking system. There were disc brakes on the front and drum brakes on the four rear wheels. This further enhanced the vehicle’s drivability. These features made the handling of the GMC RV easier than the boxy RVs of the time. It also made for easier entry and exit from the vehicle, reduced wind resistance and rollover risk. It made the GMC motor home far easier to operate and safer for those who had no prior experience driving vehicles larger than a car. Previous motor home designs focused on the comforts of using the RV as a home away from home at a camping spot or mobile home park. The GMC motor home was targeted a somewhat different type of RV buyer. It was designed to make getting to the destination less cumbersome and easier for the everyday driver. Also, the GMC RV featured a panoramic windshield, making the view of the road superior to pretty much any other motor home at the time. The GMC motor home was available in 23 foot and 26 foot lengths. This actually was a fairly small RV even at the time. The motor home’s interior was compact and featured no permanent sleeping areas. Beds were converted from sleeping areas when needed. This allowed for better use of interior space. The fridge was powered by a standard auto battery. While this was fine for short-term use, its power source was only good enough for overnight before it needed recharging. Also, the water heaters were quite effective, using engine coolant loops. Unfortunately, the water could become so hot - with temperature in excess of 200 degrees Fahrenheit, that it could actually represent a scalding hazard. So, you had to be careful. Thirty different floor plans were available, so there were many different interior options. This wide variety of floor plans allowed you to find a model that fit your specific vacation plans best. So, how would the GMC motor home fare on the open market? The GMC RV prototype debuted at the Transpro ‘72 trade show in May 1972 in Washington, DC. Production began in 19773 with two models. There were the 23-foot Model 230 and the 26-foot Model 260. GMC actually produced motor homes with both finished interiors and unfinished interiors. Those unfinished interiors were sold to Avion and Coachman, who then furnished the RVs with their own interiors before reselling them. On the open market, GMC motor homes were priced between $35,000 and $40,000. Unfortunately, despite GMC having innovative design for their motor home, they entered the market right before the energy crisis. 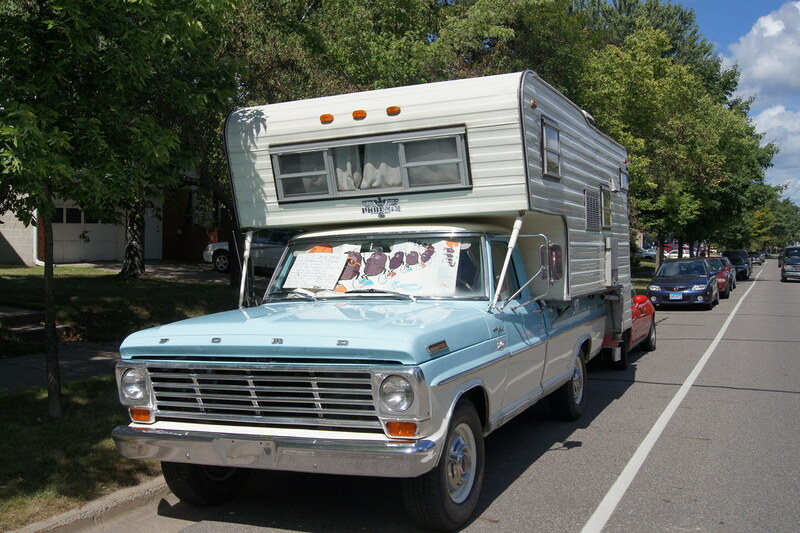 With fuel prices skyrocketing, many people decided not to buy the larger motor homes any more. To increase fuel efficiency, GMC replaced the Oldsmobile 455 engine with a 185-hp, 403 cubic inch engine. This engine was actually seen in many other Oldsmobiles at the time. Because of the poor timing at entering the market, the GMC motor home never sold a high volume. After producing 12,921 vehicles, GMC decided to retire their motor home after the 1978 model year and switch to light trucks. The good news for GMC motor homes is that their relative rarity made them instant collectibles almost the moment that production stopped. Fans of the GMC RV created owners’ associations to make getting parts and service for these unusual motor homes fairly easy. In fact, service for these vehicles even became a cottage industry. In 1992, when GMC decided to scrap all remaining parts and tools for the motor homes, Cinnabar Engineering seized the opportunity to purchase all of the remaining supplies. They also negotiated a deal with GMC to continue providing parts for the GMC motor homes. That same year, a monthly magazine called GMC Motor Home Marketplace debuted. Two years later, Cinnabar started publishing the quarterly newsletter called GMC Motor Home News. This publication ran through December 2010. GMC Motor Homes became collectible toys, too. Mattel even created more than fifty different diecast GMC Motor Homes models for their Hot Wheels line. In 1977, Mattel even released three toy GMC Motor Homes as a Barbie Doll Star Traveler promo. There are still over 8,000 GMC motor homes registered today. Many of them are still worthy of camping trips! There are still plenty of places online to find more information about the GMC Motor Home and find parts and places that will service them. Because of their rarity and popularity, used GMC motor homes still sell north of $10,000 on the open market. Models in top condition can fetch $15,000 or more. What do you think of the GMC motor home? Diesel Motorhomes VS Gas Motorhomes: Which is Right For You? One of the most important questions to answer when buying a motorhome is whether you are buying a gas motorhome or a diesel motorhome. As far as the interior and overall performance, there are few differences. But, the major differences between gas motorhomes and diesel motorhomes are the price and the gas mileage. Because diesel motors are more expensive to purchase upfront, diesel motorhomes can cost significantly more than gas-powered motorhomes. However, while the maintenance can be more expensive when it has to be done, overall, diesel motors are known to last longer than gas-powered motors. The major advantage to diesel motor homes is that they have a higher fuel-to-power ratio, meaning you get more horsepower and torque while consuming less fuel. The other upside is that diesel motorhomes depreciate less quickly. Today, there are many large gas-powered motor homes, especially from Ford and General Motors, that offer excellent performance and are comparable in horsepower and torque to diesel-powered models. Of course, while the gas-powered motor homes are more affordable, you do pay a cost in more frequent maintenance and higher fuel costs. Gas-powered motorhomes also tend to depreciate more quickly, especially when it comes to mileage. Because the larger diesel motorhomes are built more like tractor trailer trucks, they tend to have much more powerful transmissions and have more powerful brakes than gas-powered motor homes of comparable size. However, there are also diesel-powered motor homes that are much smaller using the Mercedes-Benz Sprinter van chassis. They get the fuel efficiency of a diesel-powered van with all of the same conveniences as a smaller gas-powered motorhome. However, these also have more powerful transmissions than many of their gas-powered counterparts. In either case, if you plan to drive a lot in the mountains, diesel motorhomes are going to handle the wear and tear much more effectively. Mountain driving is extremely hard on ordinary transmissions found in gas-powered motor homes. So, because diesel motors naturally have higher power-to-fuel ratios than gas, the more powerful transmission is necessary. The power that drives tractor trailer trucks is what gives diesel motorhomes an advantage in that way. Overall, diesel motorhomes tend to be more durable when it comes to the motor and transmissions. If you aren’t planning on a lot of mountain driving with your RV and don’t plan on making consistent cross-country trips, gas powered motor homes can be a good option. While gas-powered engines tend to require more frequent maintenance than diesel motors, tune-ups, oil changes, and other maintenance tend to be less expensive than on the more specialized diesel motors. The auto parts are also less expensive for gas-powered vehicles, and if you spend a bit extra on higher-quality and high-performance parts, you can get a lot of value for your money. However, if you tend to go on frequent cross-country trips and use your motor home as your primary vehicle, the wear and tear from constant driving will take their toll on a gas-powered motor and transmission. While newer gas-powered models have more efficient motors that offer higher torque than their predecessors, gasoline will never offer the same power-to-fuel ratio as diesel fuel. So, the engine has to work harder and therefore, will not last as long. It is possible that when your gas powered motor home surprasses 100,000 miles, your engine may need a major overhaul or transmission work may be needed. This is something important to keep in mind. If you have an aftermarket transmission or other non-stock components installed into your motor home, however, you can increase the life of your motorhome’s engine significantly. The major reason that people are willing to shell out the big bucks for the bigger diesel-powered motor homes like those from Fleetwood, Monaco, Newmar, and Holiday Rambler, is simply that their motors tend to last forever. Even though the maintenance and oil changes can be significantly more expensive, the motor and transmission are so durable that they may outlive the motor home chassis itself! The other major advantage of the larger diesel motor homes is that they typically run quieter, due to the engine compartment being in the back, like in buses. Even the smaller diesel-powered motor homes that have the engine in the front use six-cylinder or eight-cylinder turbo diesel motors than run much quieter than the comparable V8 or V10 gas-powered motors. Also, diesel motorhomes can carry more cargo and have heavier internal amenities than on gas-powered motor homes. That’s because they have higher towing capacity, as those motors are designed for hauling lots of weight. You can have heavy materials like china toilets and Corian countertops in your diesel motor home without thinking much about how it will affect your vehicle’s gross weight. So is Gas-Powered or Diesel-Powered Better for a Motorhome? The good news is that with the continuous advances in engine technology, gas-powered motor homes are becoming more efficient and powerful every year. Of course, diesel technology is also improving all of the time, with some of the more modest-sized diesel motorhomes getting similar gas mileage to a full-size pickup or SUV! However, there are advantages to both. It all depends on how you plan to use your motorhome. If you have a secondary vehicle in which you will do most of your around town driving and really only drive your motorhome from destination to destination, gas powered motor homes should serve you well. But if you basically live on the road, there are major long-term advantages to owning a diesel motor home, especially in terms of motor and transmission durability and gas mileage. As long as you are aware of the various costs involved with maintaining gas and diesel powered motor homes, you can do well with either a gas-powered or diesel-powered motorhome. As with anything, it all comes down to personal preference and what vehicle you feel fits your needs best. The largest motorhomes are going to be diesel-powered and mid-size motorhomes are fine when gas-powered. It all comes down to which motor home that you feel most at home in. Which will you choose for your motorhome: gas-powered or diesel-powered? Are you a regular weekend camper who would love to own an RV but don’t want to invest in a motorhome or travel trailer and aren’t really a fan of pop-up campers? Don’t worry! There’s an economical and easy way to enjoy the RV life that you can slide right into the bed of a pickup truck. Learn the pros of truck campers and how they can be a great option for your camping needs. Truck Campers are Compact, But Still Comfortable! You may be thinking, how can a camper that fits into the back of my truck be comfortable? Actually, compared to many other RVs, truck campers offer many of the same comforts of a larger trailer or motorhome. So, if you don’t want to do traditional tent camping, a truck camper gives you a lot of the benefits of an RV for a lower price and ease of transport. While there are basic truck campers that offer little more than a bed, there are truck campers with kitchen and bathroom facilities. Some truck campers even have slide-outs for additional living space! While small, truck campers can serve as practical, efficient little camping vehicles. Truck campers sit securely inside of the flatbed portion of your pickup truck. The major advantage of a truck camper is that it greatly reduces your overall footprint. While travel trailers and motorhomes can be large and cumbersome, truck campers fit right into a truck. So, you can be just as mobile as you would ordinarily would be inside of your truck. A truck camper also allows you to go on much rougher roads that most people would typically risk with a trailer, fifth wheel, or motor home. Your truck’s 4x4 capability won’t be at all hampered by having a truck camper installed, long as your truck is able to carry the added weight efficiently. Truck Campers are Lightweight and Easy on Your Truck’s Gas Mileage! Truck campers are built with wood and steel frames just like most other RVs. Then, they are covered by corrugated aluminum or fiberglass siding. Some more high-end truck campers are even insulated for greater comfort and year-round usability. Still, being so much lighter than most towables, your truck’s gas mileage won’t be all that affected by it being there. Despite just fitting into a truck cab and being an average of only eight feet long, even the most basic truck camper contains more than you’d think. The more basic truck campers have sinks with hot & cold water, a stovetop, Porta-Potty with removable storage tank, a sitting area, and generously-sized sleeping area. While many smaller models don’t contain a shower inside, they do often have an outdoor shower with a privacy curtain provided with the camper itself. Even small truck campers additionally have propane and water storage tanks, so boondocking for a short time is a possibility. Higher-end truck campers can be as long as twelve feet length with over-cab extensions. These deluxe campers can have a small bathroom with a shower inside. You can even have a queen-sized bed with a flat-screen plasma TV and surround sound system to watch and listen to when hanging out on cold or rainy nights. You can even cook a full meal with a multiple burner stove top and oven, with a fridge and freezer to store plenty of food. With the same heating and cooling system as regular campers, why rent a hotel room? How Much Do Truck Campers Cost? Most truck campers are even more affordable than the low-end travel trailers and motorhomes. You can find them brand-new for under $10,000, and they are considerably less if you buy them used. Some RV dealers even sell truck campers along with a truck to slide it into, which can be an even better deal. The best part is that you don’t even need a high-end truck for most truck campers. There are higher-end truck campers which can approach $30,000 in price that have additional amenities such as the insulation and slide-outs. But, it’s likely that you can find a truck camper within your budget if you decide on what factors are most important for you. Here are some things to consider when setting out to buy a truck camper. What weight of truck camper can my truck handle? The lighter truck campers will typically be significantly less expensive than the heavier ones with added amenities. The larger truck campers can be as heavy as 3,000 lbs, so keep this in mind. Do I want to detach my camper from my truck while staying at a campsite? You can buy a jack to make your truck camper free-standing when at home or at a campsite. So, consider this additional expense if you want this option. What space must my truck camper have? Truck campers come in so many shapes and sizes. Some have cabovers, pop-up roofs, and even slideouts. These options allow you to maximize your storage and living space, but can come at significant added cost. What creature comforts must my truck camper have? Ideally you want your truck camper to have an air conditioner, toilet, and some sort of kitchen, even if its just a simple camp stove, mini-fridge, and/or a microwave. Do I want to be able to use my truck camper year-round? If you want to use your truck camper year-round, it’s a good idea to buy a winterized model. These winterized truck campers include double-glazed windows, heated tanks, upgraded insulation, and a higher BTU furnace than those found in basic models. Can I Live Out of a Truck Camper for Full Time RV Living? If it’s just you, or one other person, planning to do full time RV living, a truck camper is an economical and practical option. For full time RV living, you certainly want to have a winterized model with at least a cab-over area and perhaps slide-outs, with at least a kitchenette and toilet facility. So, yes, with a weatherized model with a fair amount of living and storage space, it’s most certainly possible. That’s especially true if you have an extended cab truck for additional storage. With a truck camper and a reliable pickup truck, you can go just about anywhere and fit into regular parking spaces with ease. If you’re not comfortable with towing a large trailer or fifth wheel and don’t want to deal with the higher fuel costs and size of a motorhome, a truck camper is a great alternative for those that want to live the RV life! Looking to buy a used pop up camper? You definitely want to be prepared before you go to buy pop up campers. Do your research on what you’ll be towing your pop-up camper with, what campers will fit into your budget, and what layout you’re looking for that will best suit your needs. In addition to these, here are some buying tips for pop up campers. What Tow Vehicle Will You Be Using for Your Pop-Up Camper? The most important thing about buying any towable camper is knowing what your tow vehicle can safely tow. Your vehicle’s owner’s manual will have the manufacturer’s towing recommendations. At times, this information isn’t clear, so you may have to visit the manufacturer website or even call one of your auto maker’s dealers. RV dealers are usually a good resource to learn this from, too, as they deal with these questions on a daily basis. Many people will exceed their vehicle’s tow capacity, as many vehicles can technically tow more than the recommendations, but you’re putting safety at risk. A good RV dealer will let you know what a safe towing weight is for your specific vehicle. Safety first! Just like with buying a home, you want to set aside at least ten to twenty percent of your budget to make minor repairs or improvements to your used camper. While used campers sold at a dealer typically are free of major damage, there may be minor wear and tear that you want to deal with before setting out on the road. You may also want to redecorate and add your own finishing touches to the camper to make it your own. It’s also just a good idea in case you run into necessary repairs down the line. When shopping for pop up campers, you’ll want to research the various floor plans available from different makes and models. While pop up campers tend to be small, they can fit a kitchen, bathroom, and sleeping areas quite well into a small space. You want to get the most practical space for the money. While some pop up campers are really fancy, they may not be practical for your purposes. The best way to get a feel for a floor plan is to visit an RV dealer or RV show and actually visit different pop up camper models in person. When buying used, though, you may have to compromise when it comes to trying to get your dream floor plan. Still, knowing what models will serve your needs greatly narrows down your choices of a camper that you’ll be happy with. The number one issue with used pop up campers is potential moisture and water damage, Because so much of the camper’s structure is made from canvas, it doesn’t take much damage for water to intrude. Left unrepaired and untreated, these little holes can lead to moisture or water severely damaging the camper structure. Examine any used pop up camper you’re considering to buy very carefully. Closely check the screens and canvas for any holes or rips, no matter how small. Also, watch for any mold. If you see any signs that water has intruded previously, be very cautious, as this type of damage is extremely costly and difficult to repair. Unless you have absolute proof that the water intrusion problem was properly fixed, It may be in your best interests to pass on that particular camper. After ensuring that your pop-up camper won’t let any water inside, ask to see the lift system working in action. This is extremely important as it’s the entire reason you want a pop-up camper in the first place. Then, if the lift functions properly, see the heating & cooling, water, and electrical systems in action. Once these things are in order, watch how well the pop-up camper closes. Make sure that the roof seals tightly once it’s fully lowered. If it doesn’t, that means water could get in and accumulate. Even if the water doesn’t get inside the camper itself, excess water could damage the mechanical systems, and your pop up camper could become a pop less camper. The canvas and mechanical systems are next on the list. Check that the lift system works properly and that the roof seals tightly when lowered. Run all the systems in the pop up, such as heating, cooling, water and electrical. On the outside check that the lights function properly and that the tires are in good condition. When Buying Used Pop Up Campers, Buyer Beware! Of course, if you discover any major problems with a used pop-up camper, you likely want to walk away. The potential repairs now or down the road may not be worth the investment over simply buying a brand new or better condition used camper. Then again, if you encounter only minor issues but really like the camper overall, you may be able to bargain a better offer in light of the inspection. If you’re willing to take the risk and can get a very good deal, you may consider still buying the pop up camper anyway at a discounted price. That’s, of course, if your budget allows you to make necessary repairs. When buying a used camper, if you make a fair offer and the seller won’t budge on price, you may want to walk away. Know what your budget allows and don’t get talked into making a deal if it’s not worth the risk of future expenses for you. Whatever you do, as when you buy anything, get a good deal and stay within your budget. Pop-up campers are a great way to enjoy camping and are easily towable by a wide range of vehicles. But when buying them used, just know the risks and potential hazards in buying a previously used pop-up, since so many things can go wrong with just one tiny hole or rip in the canvas. Make well-informed decisions, be safe, and have fun in your hunt for your perfect used pop up camper! Unlike a traditional travel trailer, fifth wheel trailers are a class of RV towed by a pickup truck using a special hitch installed in the truck bed. Like any towable RV, fifth wheels provide all the comforts of home, with areas for sleeping, dining, and bathing. Standard fifth wheel trailers are practical investments for those who like to take weekend getaways and long vacations. There are also luxury models that are quite spacious and can actually serve as the perfect choice for full time RV living. How Much Does a Fifth Wheel Trailer Cost? Fifth wheel prices are actually quite wide-ranged. There are fairly affordable models starting at just $10,000 for a brand new trailer. These aren’t going to be luxurious, but certainly be adequate for occasional family vacations. Many luxury fifth wheel models can cost upwards of $100,000 or more. Most RV buyers tend to purchase fifth wheel trailers somewhere in the middle between these price points. The luxury models do have their perks, however. The premium fifth wheel models include high-end kitchens and living areas, plasma televisions, and even separate bedroom areas, including a master suite that sits over the truck bed. Keep in mind that you’ll need a pretty big and high-powered truck, perhaps even a dually, in order to tow these luxury models properly, which is even a bigger investment. Most casual RV travelers can get away with the lower-end models. These fifth wheel trailers are far more modest, but can be towed by most ordinary pickup trucks once the special hitch is installed. But if you’re looking to travel cross-country on a regular basis, you’ll definitely want to consider at least a mid-range fifth wheel trailer, even if you have to buy one used. It’s true that fifth wheel trailers are more expensive than traditional tow-behind travel trailers. But, many campers and full time RVers prefer fifth wheels because they are far easier to tow. Being hitched in the bed of your truck, they are much more stable than on a traditional tow hitch. One of the major cons of towing a travel trailer is how difficult they are to tow, especially in windy conditions. Because they tend to sway, they can make your tow vehicle work a lot harder, which stresses the tow hitch and decreases your gas mileage - not to mention wear and tear on both vehicles. Meanwhile, fifth wheel trailers almost never sway. Which Fifth Wheel Trailer is Right for Me? When setting out to choose a fifth wheel, list your minimum needs and see what models fit with your budget. You may also choose to purchase a used fifth wheel, which are actually fairly easy to find. Also, consider the vehicle you’re using to tow the fifth wheel. If you’re using your personal truck, know what your truck can tow safely and easily. Since you’re not using your truck’s actual tow package, you want to be sure about the rating of your in-bed hitch and what your truck is rated to tow overall, not just what your regular tow package will allow. Knowing the GVW (Gross Vehicle Weight) that your truck can handle will narrow down your choices. Just like buying any vehicle, buying a fifth wheel is an investment. So, shop around and see models inside and outside in person to get a feel for each one. Be sure to have a complete list of the features and equipment included. Remember that showroom models may not necessarily have everything you see come standard. Although some dealers do say that what you see is what you get, that’s not always the case. Also, understand the warranty that the trailer comes with, and purchase an extended warranty if you feel that one is necessary. Also, like cars, fifth wheel trailers (and any RV for that matter) depreciate quickly. So, buying a used fifth wheel may be your best bet, if you don’t mind some wear and tear. Whether you buy new or used, be sure to get consumer reports online for makes and models for the years you’re considering. That way you can see which models tend to hold up the longest, which also typically have the best resale value. Be sure to get the most features for the best price. But, I Really Want to Buy a New Fifth Wheel! While many used newer models have been well cared for, you may decide that you absolutely want a brand new RV. If you do insist on buying a brand new fifth wheel, try to shop around for deals,. Look for dealers that offer deep discounts off of MSRP for brand new fifth wheels, which are often the previous year’s model. They don’t want to keep them sitting on the lot, after all. Besides price, the big advantage to shopping for new examples of previous year models is that there’s more reviews available. So, you can be better informed about your purchase. Another great way to purchase a new fifth wheel is to visit RV shows on the last day. That’s because RVs are very expensive to have to transport back to wherever they came from. So, many salespeople are happy to cut some deals in order to not have to take their unsold models back home. Whatever fifth wheel you decide to buy, you can know that you’ll get a very reliable RV that will serve you well on your getaways. If you do plan to plunge into the adventure of full time RV living, a fifth wheel is an awesome choice for your home on wheels. During the summer months, you want to make sure that your air conditioner is in the best possible condition to keep you cool and comfortable. That’s especially true in your trailer or motorhome. RV air conditioner maintenance should be done regularly to make sure that all components are working properly. If RV air conditioners aren’t properly maintained, they can be very expensive to repair. You don’t want your RV air conditioner quitting and ruin your summer vacation, after all. An RV air conditioner is similar to the split system air conditioners you find in some homes. This means that the condenser and compressor units are installed outside, in this case on the roof. Then ,the air-cooling unit is installed inside, on the ceiling. One unit is enough for many RVs, but for RVs that are longer than 35 feet may need two units to keep the space relatively cool. Here are some tips to keep your RV air conditioners operating well through the spring and summer months. Your RV air conditioner filters should be washed or charged at least once a month. When the RV air conditioner is in use, disposable filters should be changed every month. If you use reusable filters for your air conditioner, they should be washed with water, then left ot drop dry before putting them back in. It’s important to avoid having clogged air filters, since clogged filters can lead to lower efficiency, higher energy using, and potential damage to other A/C components such as the evaporator coil. Also, while changing the filter, using a damp cloth with a bit of dish detergent should be used to remove dirt and dust from the entire unit. You don’t want to be blowing all of that around! The evaporator coil is one of the most important components of your RV air conditioner. If it’s not kept clean or becomes damaged, your A/C efficiency will be greatly reduced. The coil is located on the back of the rooftop part of the unit, so not only is it exposed to the elements but to possible damage from leaves, tree branches, and other hazards. This coil is the part that circulates the cold refrigerant in your air conditioner, so you want to make sure this component is cleaned regularly. Use a soft bristled brush to remove any dirt that’s accumulated on it. While some RV air conditioner units already have shields for the fins and coils to protect them from the elements and potential damage, not all do. If your A/C unit lacks shields for these things, it may be a good idea to have them installed. Condensation can often occur due to much of the A/C components being outside. Because of this, the gasket seals on your RV air conditioner can become damaged. So, the gasket seal between the ceiling and the bottom of the unit should be checked regularly. Also, the drainage holes in the condensate pan should be regularly cleared of any debris, such as leaves. Any clogs can cause condensation to leak into the RV. Not only is this an annoyance, but the excess water still inside can damage your A/C unit. Before you set off on your big summer trip, start your RV air conditioner to make sure everything is running correctly. Be sure the the fan and your temperature control are working properly. Also, when checking your A/C, be sure that you have an adequate power source. A 15-amp extension cord may not be sufficient for some RV air conditioners, especially on larger RVs. You don’t want to underpower your A/C when checking it, because insufficient amperage can actually damage your A/C motors, compressors, and other components. Check your A/C unit’s power requirements for the right amperage and make sure that you have the right switches and circuit breakers installed in your home to not cause power issues. By following this regular RV air conditioner maintenance routine, you should be able to enjoy summer after summer with well-performing air conditioning. Have fun and stay cool. In the United States, lemon laws protect consumers from purchasing defective new vehicles from auto dealers. These statutes are in place so that consumers can take recourse against the manufacturer if the vehicle proves to be unreliable. However, when someone buys an RV, consumers may not realize that RV lemon laws vary from state to state. When you’re buying an RV, your state’s lemon laws vary when it comes to fixing defective recreational vehicles. In fact, in the United States, most states’ lemon laws don’t protect you against problems with your RV if they are over a certain weight or don’t have to do with the vehicle’s drive train. Learn about how your state’s lemon laws cover your RV. Why are RV Lemon Laws Different From Those for Other Autos? RV lemon laws tend to be different because of how RVs are constructed. Unlike many cars, trucks, vans, and SUVs, which are mass-produced, RVs are often assembled by hand. Also, the parts are typically made by several different companies whereas most other vehicles have the majority of their parts coming from a single manufacturer. So, this means that the chassis can be made by an auto maker, while the body and living area are made by one or more other companies. This means that there isn’t a single manufacturer that can be held responsible for vehicle defects. In the past, this meant state lemon laws didn’t want to deal with figuring out who to hold responsible and they simply didn’t cover RVs. In the past, only a handful of US states had lemon laws that covered RV’s. But with the growing popularity of RVs, states now have been expanding what their RV lemon laws actually cover. This is no longer the case. In every US state, any and all defects in an RV must be repaired within a “reasonable” number of chances in a “reasonable” amount of time. This is good news. However, know your state’s lemon laws well. You can do this by just doing a search for “(Your State) RV Lemon Laws” in your favorite search engine and it should come up. 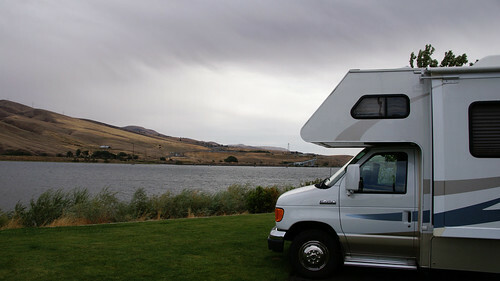 Some state RV lemon laws have restriction. In some states, only the living areas are covered and in other states, only the chassis (drivetrain) is covered. Also, some states limit coverage by your RV’s weight. So, you’ll have to read the entire state’s lemon law to find out what exactly is covered. What US States Offer the Best and Worst Lemon Laws? The good thing for consumers is that there is an online resource that lists all 50 US states and what each state’s RV lemon laws cover. This list from Lemonlaw.com is current as of 2018 and lists a summary for the RV lemon laws in each US state. Some states are very limited on what they will consider under a lemon law. For example, Arizona only covers RVs under 10,000 lbs! Of course, you still want to read your individual state’s lemon laws in their entirety. How Can I Minimize the Risks of Buying a Lemon RV? Besides knowing what your state covers when it comes to buying RVs and buying accordingly, there are other ways to protect yourself in the case that you do end up buying a lemon RV. First of all, examine the warranties that are offered with RVs you’re considering purchasing very carefully. If you feel that the warranty isn’t good enough, and your state’s lemon laws won’t cover certain things, you may want to consider purchasing an extended warranty for your RV. Next, make sure you do some research on the past reliability of the class and manufacturer of each RV you may want to purchase. Some classes of RVs experience certain kinds of problems more than others, and certain manufacturers are known to have difficulty with certain parts failing than others. If you find that a manufacturer or type of vehicle has problems that won’t be covered under lemon laws or that vehicle’s warranty, you may want to consider purchasing a different RV. Another precaution you can take is to ensure that the vehicle carries a RVIA seal. This seal from the Recreational Vehicle Industry Association means that the RV manufacturer belongs to an RV industry group which requires its members to meet a set of safety standards. Those standards include a list of five hundred items. This gives you peace of mind that the quality control of the RV you are buying is very good. So, when buying a new RV take all of these precautions in mind. Do your research on your state lemon laws and what RVs could potentially be lemons more than others. You’re buying your RV to enjoy weekend getaways, long vacations, and potentially even full time RV living. The last thing you want is to be spending your vacation at home - or worse at a motel - while your RV is in the repair shop. Be sure that you know what protection there is for you if you do buy a lemon RV. Get the best RV for you and go and have fun! I Want to Buy an RV! What Should I Do? If you’re considering buying an RV, whether it's a motor home, travel trailer, or other type of RV, you actually consider many of the same things that you would if you were buying a car or truck. Don’t let dealers take advantage of you. Be well-educated about the types of RVs available and what a fair price to pay for each should be. Keep in mind that if you’re buying from a dealer, many dealers add a fifteen to thirty-five percent markup on the MSRP prices, due to incentives from the RV manufacturers. Definitely visit two or three RV dealerships before making a final decision on purchasing an RV. Also, see what sorts of warranties and service the dealer you’re buying from offers. Most dealers are happy to be your best friend while you’re deciding on the motor home you buy. But after buying, a lot don’t want to be bothered unless you’re coming back to buy a new RV. So, definitely find RV dealers that are happy to work with you for the life of your recreational vehicle. Of course, you can also buy RV’s from used auto dealers and third-party sellers. Auto dealers that don’t specialize in RV’s tend to offer lower prices, although their service probably won’t be as good in the long term. So, keep that in mind. Also, with third-party sellers, you’re completely on your own once the title and keys are in your hand. But, you can also potentially get the best deals, even if some serious maintenance of the vehicle is in your near future. Whatever you do, as with buying anything, be sure to do your due diligence. A motor home is a great vehicle to have. Just know the market, especially when buying used, and know the potential risks involved with maintaining old, larger vehicles. Then, find the motor home that’s your soul mate, and enjoy your RV adventures! What RV do you want to buy? RV Trends: Recreational Vehicles Are Becoming More Like Homes Than Campers! Motor homes aren’t just for camping anymore. Today’s recreational vehicles can come fully equipped with all the comforts of home. If you can stretch your wallet far enough, you can have plasma televisions, washer and dryer, and even granite countertops and ceramic tile floors! Heck, you can even have your RV’s interior space professionally designed! From the roomy Class A and Class C motor homes, to the Class B van campers, to the travel trailers, every kind of RV out there is getting classier every year. Many travelers love how versatile an RV can be. Some have even turned to full time RV living in their rig! You can park your motor home or travel trailer at many trailer parks or campgrounds. While it does take some practice learning how to drive a larger motor home or towing a travel trailer, the payoff is well worth it. It’s awesome to have a house on wheels. Plus, if you’re towing another vehicle, or using your vehicle to tow your RV, you can take your other vehicle around locally. That saves on gas and can be more practical in certain areas. For those that have decided to take on full time RV living, I salute you. It’s a great adventure and you really can do it with any RV if you’re willing to live with the pros and cons that come with each type of RV. It’s true that RVs are no longer simply second vacation homes on wheels anymore. They truly are becoming homes all to themselves. Would you ever consider taking up full time or even part-time RV living? When you buy a motor home from a dealer, it will always come with a warranty of some sort. But, should you buy an extended warranty for your motorhome? Let’s learn about a motor home extended warranty and what you should expect to pay for it and what it covers on your motor home. The first major thing to consider about purchasing a motor home extended warranty is whether you bought your motor home new or used. Newer vehicles will attract longer term warranties than older ones, just as with cars, trucks, and vans. Of course, whenever that warranty expires, you’ll be exposed to the risk of having to pay for expensive repairs that may have been covered by the warranty. So, just as with anything you purchase, you have to determine the risk versus the reward of paying for a potentially pricey warranty. Let’s talk about the benefits of an extended warranty for your motor home. Just like any extended warranty, purchasing one for your motor home offers peace of mind. That can be worth a lot of money if you use your motor home on a semi-regular or regular basis. They’re also pretty easy to purchase on the internet these days, meaning that you don’t necessarily have to purchase one directly from the dealer. Why’s this? That’s because dealer extended warranties are more expensive because they cover dealer commissions. However, when buying cheaper online warranties just beware. Actually, you want to be careful even if you purchase one through a dealer. Make sure you real with reputable companies underwritten by “A” rated insurers, especially rated by Standard & Poor. NEVER buy an extended warranty from companies that don’t disclose the rating of the company backing the policy, for motor homes or anything else. While an extended warranty is available on both used and new motor homes, used motor homes with high mileage won’t be eligible for motor home extended warranties. This is true of most vehicles, of course. But with a motor home, it’s a risk to be very well aware of when purchasing one with mileage approaching or exceeding 100,000 miles. What Can Affect the Price of Motor Home Extended Warranties? So, once you find a good company that offers a motor home extended warranty, how much will it cost? Here are a few guidelines to give you an idea of the potential cost. In general, diesel motor homes tend to be more expensive to warranty. That’s because typically diesel motor homes are more expensive due to the fact that they typically offer better gas mileage and less overall maintenance. The diesel pushers, where the engine is in the back like many buses, tend to have the most expensive warranties. If your motor home has a Renault-built engine, many companies won’t offer you an extended warranty. These motors are sometimes found in RV models using a Mercedes-Benz chassis. Likewise, some engine modifications will void a motor home warranty. Of course, many people choose to install a turbocharger on their motor homes. Extended warranties that cover motor homes with this modification tend to have higher premiums, so keep this in mind. With longer extended warranties, there’s going to be a surcharge for each year added to the warranty as the vehicle ages. If you buy a used motor home, there will also be surcharges as the vehicle’s mileage increases. Any added equipment such as stereo systems, satellite dishes, and televisions will incur additional surcharges, as many extended warranties cover these particular items. To get a quote on an extended warranty for your particular motor home, contact a few companies and get to know the differences between various policies. That way, you can make an informed decision in deciding what’s worth paying for and what’s not. Then, choose the extended warranty that fits your needs and your motorhome the best. Winnebago Minnie Winnie Class C Motorhome. Which RV Type is Right For You? Are you interested in purchasing a motor home? Understanding the different types of motor homes can be overwhelming when trying to decide which RV type is right for you. In this guide, we’ll go over the different classes of RV, both trailers and motor homes. Some motorhomes are designed specifically for only two to four people. Others can sleep six to eight people or more. Travel trailers and fifth wheel trailers also come in many different shapes and sizes. There are so many layout and configuration choices when it comes to RVs. But, there are several classes of RV to understand in order to narrow down your choices when it comes to choosing your perfect motor home. In the case of motorhomes, there are some major things to consider. There are motor homes with automatic transmissions or 5-speed manual transmissions. Also, different motor homes have different engines and fuel requirements. Motor homes use a lot of fuel and while many diesel models tend to be more fuel-efficient than gas-powered models, that isn’t always the case. So, do your research. Obviously, with trailers you won’t have to worry about engine types and such. But you will have to consider what to tow it with. There are two major types of RV trailer: travel trailers and fifth-wheels. There are also truck campers, which actually connect into the bed of a pickup truck. We’ll get into these various classes of RV trailer in a bit. Other things you’d want to consider are the amenities you’re looking for with your RV. Some of these may include chemical toilets with flushing capabilities, fresh water and waste water tank sizes for holding fresh water and waste water, hot water heater capacity, and air conditioning. Motor homes and trailers can also usually include various sizes of kitchens. Most contain a refrigerator and many have a microwave. Fortunately, when you’re browsing RVs, the basic specs and equipments provided with each model of motor home or trailer will be listed on the manufacturer website. So, there isn’t a guessing game when it comes to knowing what each RV model has to offer. That way, you can narrow down exactly what features are important to you when making your choices. Now that we’ve gone over the basics, let’s look at the various classes of RV. These include the Class A Motorhome, Class B Motorhome, Class C Motorhome, Fifth Wheel trailers, Travel Trailers, Truck Campers, and Van Conversions (or caravans as they are called in Europe). In Europe, caravans have been popular for travel for years. These converted vans have become increasingly popular in America, Australia, and other places, as well. They do have the reputation of being “old school,” which is something that does attract people to them. However, they also have a reputation of being cramped, slow, and underpowered. On the other hand, there are plenty of van conversion RVs that aren’t underpowered at all. Some of them have engines on par with the larger RVs and some are actually very similar to the Class B motorhomes that we’ll get to shortly. If you’ve been considering a van conversion, and it’s just you and one other person, a van conversion or European-style caravan may be a good choice for you. Perhaps the most popular motorhome is the Class A Motorhome. For many people, they are considered the most impressive. That’s because they resemble a bus, and many are the size of smaller school buses. Some Class A Motorhomes resemble big-time tour buses. Like on a touring bus, Class A Motorhomes have a cabin where the driver and a passenger sit. Behind the cabin is a luxury vehicle that not only allows for luxurious road trips and vacations, but are the perfect choice for full time RV living! The main appeal of Class A Motorhomes is that they typically can contain everything that a typical home can. These include appliances, even washers, dryers, and dishwashers in larger models, and can be built inside to look exactly like a typical small apartment. Larger Class A Motorhomes can sleep up to 10 people, although there are smaller Class A models that sleep four to six people. With large Class A Motorhomes, you typically see owners tow their personal vehicle such as a car, truck, van, or SUV behind them. That’s because Class A motorhomes tend to be very difficult on fuel consumption, so having the smaller vehicle to travel locally is a good idea. The Class B Motorhome is actually very similar to a cross between a van conversion and a Class A motorhome. It has a drivers cab in front, but it resembles more of a large van instead of a bus. They typically only sleep up to 4 people and don’t have all of the amenities of a Class A motorhome. The major advantage of Class B motor homes is that they can be used as a practical vehicle around town. They fit in most parking spaces and tend to be very fuel-efficient. While they are OK for going on vacations, they aren’t well-equipped for long-term RV adventures. The Class C motorhome is a popular choice of motor home for several reasons. It’s sort of a cross between a Class A and Class B motorhome. It has a drivers cab, but they have a private sleeping area above the cab, which can also be used for storage if that space isn’t required. Class C motorhomes come in a variety of lengths, but most can sleep six people comfortably. Some Class C motorhomes are short enough to fit in regular parking spaces, while others can be even 30 feet or longer like a Class A! The major benefit of a Class C motorhome is no matter the size, every Class C motorhome comes equipped with a kitchen and small bathroom. While they can be cramped to live in long-term, for only two to four people in some of the mid-sized models (23 to 26 feet), full time RV living is possible in these Class C motor homes. While Class A motorhomes are often built for luxury living, Class C motor homes are typically built with more practicality and versatility. They are a favorite of many full time RVers for that reason. In the case that you own a pick-up truck, fifth wheel trailers are a great RV option to consider. These trailers attach to the truck bed using a special attachment, which can be installed fairly easily by a local dealer. Fifth wheels tend to be far less expensive than a motor home, which is one major benefit to owning one if you have the vehicle to tow it. Fifth wheels also have the benefit of having a “second story,” which is usually a master bedroom that sits over the truck bed. But the other thing about fifth wheels is that they are still free-standing when detached from the truck. So, it can be used just like a conventional travel trailer. Another option if you have a pick-up truck is a truck camper. Like a fifth-wheel trailer, they sit in the bed of the truck. However, they don’t have any special attachments, and some larger ones can even be free-standing. These truck campers can have basic amenities such as a kitchenette and toilet & sink. The larger truck campers are good for one or two people. They aren’t ideal for long-term trips or full-time RVing, but there those that use them for that purpose. The major advantage to truck campers is that you don’t have to worry about towing them. Like the fifth wheel trailer, travel trailers are great if you have a towing vehicle. The major difference is that you can tow them with any vehicle capable of towing a trailer. You may have to invest in a better tow package for your vehicle, but many trucks, vans, and SUVs have the capability of towing decent sized travel trailers. The amenities of a travel trailer are very similar to those that you would find in Class A and Class C motorhomes. Some travel trailers are actually quite luxurious, while others are more practical. Travel trailers are widely popular because of how easy it is to find a vehicle that can tow them. They’re very easy to live out of both in the short-term and long-term and are a staple at many campgrounds and RV parks. Now that you know the major classes of RV, you can decide from these what type works for you. There are RVs in all of these classes at various price points, especially if you buy used. By knowing the various pros and cons of each class of RV, you can narrow down your choices considerably. At the end of the day, though, you’ll want to visit your local RV showroom to get a feel for each type in person. What class of RV is your favorite? Why own a motor home? Owning a motor home offers you multiple benefits when it comes to travel and vacations. Whenever you want to travel for just a weekend getaway or a long vacation, a motor home can simply your trip planning. Motor homes can offer many different solutions, from where you’ll stay on your trip, to where you’ll eat, and much more. Owning a motor home gives you the benefit of essentially having a home away from home. You have appliances and other basic household amenities. A motor home allows you to skip staying at motels and hotels, which can be very expensive and at times not even comfortable. You also can take more with you on a trip than you would in a car, van, or SUV. This means not having to buy as many things to use just for a trip. In your motor home, you can cook, sleep, and bathe. Even better, most motor homes can tow your car, and larger ones can tow vans or SUVs. You can also bring along jet skis, four-wheelers, and even boats on a little trailer you can tow behind the motor home. Motor Homes Are Great for Family and Friend Visits, Even Business Trips! You don’t just have to save a trip in your motor home for a vacation. You can drive your motor home to visit friends and family in a different city. This can save you a lot of money on hotel and restaurant costs. It’s also great to use your motor home for a long business trip. If you’d otherwise have to rent a vehicle, the extra gas costs from driving a motor home there will still be a savings. In any case, it’s going to be a much more comfortable ride for you and your family. Motor Homes Come in All Shapes and Sizes! There are so many different types of motor homes you can purchase depending on your travel plans, the size of your family, and other personal needs. You have a wide range of options from body style, length, sleeping space, layout, equipment, and other amenities. There’s a motor home out there that will work right for you. Now that you know the benefits of owning a motor home, all you have to do now is choose the motor home that best fits you and your needs. Just do a bit of research online and you’ll find the motor home for you! Most people know that bungee cords of all sizes are handy to have around. But I bet you never thought of these 10 handy uses for bungees in your motorhome or trailer. Get some bungee cords today and put them to use in your RV to see how well they work. Attach an eye hook to the wall and use it secure the tie when you need your curtain to stay open. Any lightweight bungee will do the trick, unless your curtain is exceptionally heavy. We found the 3-pack from the Dollar Tree works fine for ours. If you're temporarily using a portable toilet in your RV, you know it may shift when driving. To avoid accidental spillage, secure an eye hook to the wall behind the toilet on both sides. Then, attach a bungee. Be sure to leave space to use your flush handle, if you have one. The thicker, rubber ones are best to use in this instance, as they tend to hold more weight. We spent less than 2 bucks at Home Depot getting one that works for this. Our portable toilet is a Camco 5.3 Gallon. We used a long, thick bungee that was about two bucks at Home Depot to secure the bathroom area before we fixed it. This helped while driving because it prevented everything from flying around. This is good if your bathroom (or another room) is under construction, like ours was. It also helps if you have any other area where there may be loose furniture or other semi-big items. The bungee held in a portable washing machine, a baby gate that kept the toilet secure, and a few miscellaneous things that were tucked around those items. Your wall shelves should be secure, ideally. But if you want some extra protection, try using a bungee cord to secure the shelf even further. We often do this if we want to place something on the shelf that might otherwise fall while driving. It could be a book someone is reading here and there or something else fairly lightweight. This isn't a good solution for heavier items. Since we are in an older motorhome, this is a common problem, as we are under construction. This is a good temporary fix if your existing hardware isn't the best or you are missing the latches. In our case, we just needed to fix the latches. We don't need to use this anymore. But it worked to keep items from flying while we awaited delivery of the appropriate hardware. The simple Dollar Tree bungees were fine for this as well. When we were doing a lot of work on our vintage RV, this one helped a ton. We kept a Homer Bucket from Home Depot full with all kinds of tools and hardware that we were using every day. We didn't want to have to keep putting away and taking out these items every time we had to drive somewhere. So, we kept it secure with a bungee. The Dollar Tree bungees were fine for this as well. But remember that the heavier the item, the stronger the bungee cord should be. 7. Secure a Loose Door While Driving - If your door is loose and you need to secure it while driving to the repair shop or elsewhere, try using a bungee. Fasten it to the latch and/or screen and secure it to the inside to prevent your door from banging back and forth. 8. Tie Down Luggage - This may seem obvious, but not everyone thinks of it. If you have extra luggage that you don't want stored inside, try securing it to the roof with bungees. Heavy duty bungees should be used for this. 9. Secure an Infant Stroller - If you have a large infant stroller, like our Graco double stroller, you may not want to store it inside your rig all the time. Unless the weather is bad, we prefer to bungee ours to the cargo carrier luggage rack on back. That way, it's easy to grab and then store when going in and out of stores or entertainment facilities. This also works if you want to store the stroller inside because you may not be able to fit it inside a closet. In this case, you can bungee it to keep it from roaming around your RV. 10. Secure a Cooler Full of Groceries - If you just picked up a bunch of groceries and want to wait to put them away until you get to camp, you can throw them all in a large cooler and secure it with a bungee on the roof, in a rooftop cargo box, or in a cargo carrier. If you own a business with a parking lot, you may get annoyed when a large rig, like a truck or RV uses your lot. But think twice before calling a tow company on an RV or trucker. RV parking restrictions hurt your business big time! If a family's only vehicle is a motorhome or they are traveling, they may only get to the store once in a while. Therefore, they could be making a huge purchase at your store. By sending out a tow truck or placing a tow sticker or sign on their vehicle, you just ensured they won't make a purchase with you again. Does this actually happen when people are parked legitimately? Yes. It has happened to our family during routine grocery trips and travel stops. Please ensure that you know for sure how long someone has been in a spot before you wrongly accuse them of overnight parking or camping in your lot. Mistreat one RVer and you are likely to lose a lot of business. You can bet they will tell their friends not to shop there and word will spread like wildfire. Remember that RVers know more than just other RVers and people don't like unfair treatment of any group of people. It can easily be considered discrimination. RVers are used to overnight parking restrictions and most are glad to follow them. But please don't accuse us of parking overnight when we are just getting massive groceries and supplies in your store for a few hours. When you only shop every so often, it may take a while to gather everything you need in the store. This does not indicate intent to stay overnight . It is especially unfair when "regular" (non-camper-type) vehicles have been there longer and don't have the same warnings. Many people in RVs are not in your lot to camp. We are there to spend money with you. Selectively targeting specific customers to warn about extended parking could be seen as discrimination or even harassment. In these cases, not only will your company be seen in a bad light, but you could land in court and be out large sums of money. It's always safer (and more courteous) to take the high road and give the same treatment to everyone. How Can I Safely Fit RVs Without Disrupting Business? If you want to safely accommodate customers with RVs and other big rigs, consider a designated section for the bigger vehicles, with appropriate signage. Also, clearly post your expected time limits on parking so that we don't accidentally exceed them. This keeps big rigs out of the path of the smaller vehicles and quicker shoppers. Most RV owners consider this a kind gesture. We know we are huge and we are grateful you welcome us, despite that. Without designated parking, most of us try to park in the most courteous spot. But it's not always possible. It is sad that this has to be said. But it is necessary. We have often noticed that people in RVs are treated as miscreants, nuisances, or considered to be homeless. Not all RVers live in their rigs and many are very far from being homeless. Some are camping or traveling. Most of those who do live in them have a place to be and are not trying to live in your lot. They just want to buy groceries and other necessities, just like everyone else. Unless you have clearly posted rules that an RVer clearly violates, it can be considered discrimination to give out tow warnings or call a tow truck (or even worse, call the police). This is a massive insult and rights violation to someone who is just doing what everyone else does and abiding by normal parking rules. Again, if you have special rules, please post them so people know what to expect. Most RV owners are very happy to abide by those rules. We are happy to respect you. Please give us the same treatment. 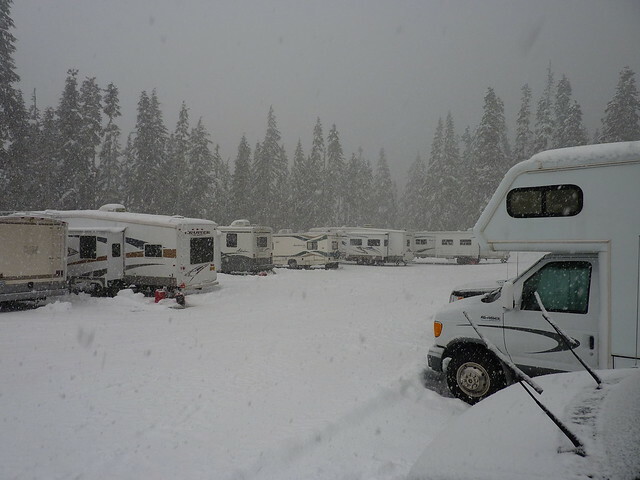 When deciding to live or camp in your RV for the winter, there are many things to consider. The most important factors include keeping the heat inside (and cold air out) and keeping all of your tanks and connections from freezing. Watch the videos below to learn what you can do to properly winterize your RV for winter living and camping. Be sure you don't winterize it for storage, rather than living, as there is more than one type of winterizing. We love the advice from the two experts in the videos below, as they offer practical tips everyone can follow and they both have different things you can apply. Roadschooling is homeschooling while on the road. Until we're back in the RV, we'll be doing what we can of that in our old school Toyota 4Runner. Recently, we took a very short road trip to Bingham Lake, which is in The Pinery (Parker), Colorado. We taught Nathan about the fish, deer, and other wildlife in the area. He even got to see some. He made some vlogs, as well as captured some photos, in addition to the footage we got, which makes for a good lesson in arts, video and photo editing, science & nature, and local history. You won't see Nathan's content in this post, as it belongs to him and he has another place to post it. Anyhow, we got to see some deer, rabbits, fish, and more all up close. The deer were mere inches away, so we were walking among them. But, obviously we did not feed or pet them. That's a big no-no! What a great roadschool/homeschool lesson in enjoying nature and leaving it as is. Here are some of the many photos from our adventure. What roadschooling adventures have you been on lately? Share your links and commentary below.